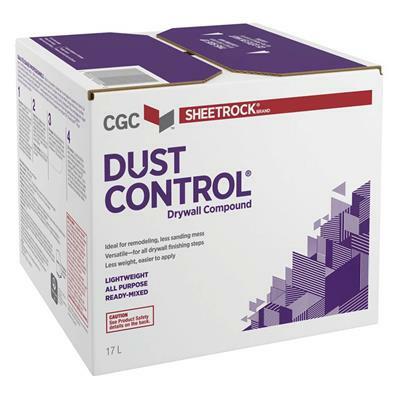 The CGC SHEETROCK 17-Litre Dust Control Lightweight All Purpose Ready-Mixed Drywall Compound is a revolutionary product that reduces the mess associated with sanding drywall compound. CGC Sheetrock® Brand Dust Control® Drywall Compound goes on the wall as well or better than other leading drywall compounds, with the added value that when sanding most of the dust falls straight to the floor and doesn't float around in the air. It is an all purpose compound that can be used to embed tape, fill and finish gypsum panels, bead, trims and fasteners. It can also be used for skim-coating over dry and non-glossy surfaces.